North Bandung has so many unique potential urban features that were utilized by the Dutch colonial town planners as influential considerations in arranging the planning concepts. The adoption of the European "Garden City" in Indonesia was initially established in this area. A mixed income levels of the housing plan - combined with strong character of "Art Deco" decorated the façades of the buildings has made the quarters unique and architecturally valuable. Today, this city has to face the challenges of uncontrolled growth mainly caused by urbanization. 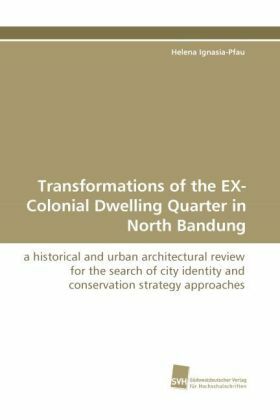 Transformations and demolitions of land use have long been going on, and have been worsened and taken on the face of the practice of commercialization, land speculation, and ongoing densification. This culminates into the neglect of rich cultural values of their The identity of such quarters. This study tries to observe and seek the existing values in the ex-colonial dwelling quarters in North Bandung both in terms of architecture and urban planning in order to understand how they became the identity of and built image in such a built environment and how they became implemented in planning in the inhabitable dwelling environment.